Cram those chips into your sandwich. I did. There are few greater kitchen smells than that of onions simmering in butter and oil. Smash those crispy, caramelly onion bits between handfuls of grated gruyere and two gigantic slices of fresh sourdough bread, and you have yourself French Onion Soup in sandwich form. 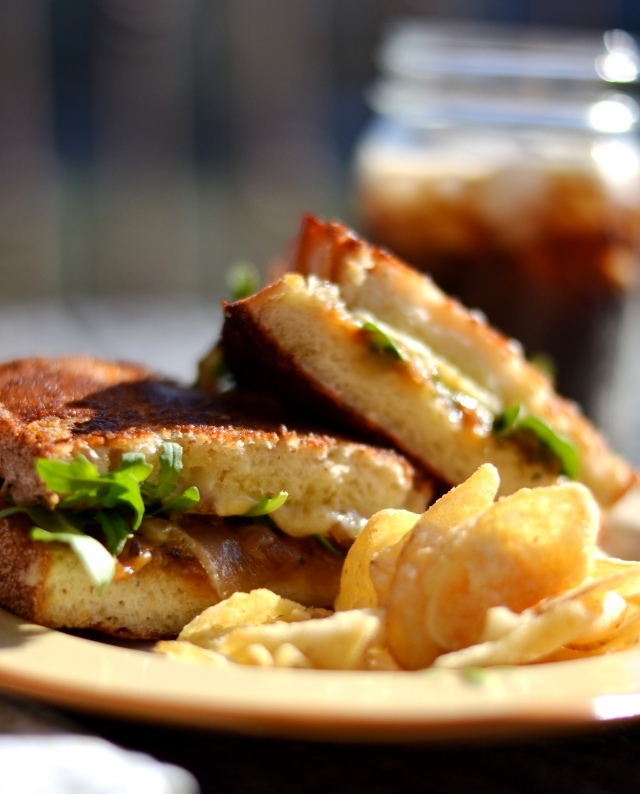 Some may call this a glorified grilled cheese, but turning a soup into a sandwich isn’t a transformation that should be reduced to “grilled cheese.” Whatever you want to call it, these French Onion Soup sandwiches are nothing short of amazing, and you should make them right now. French Onion Soup is sneaky in that it comes off as being harmless for vegetarians, but the broth is actually beef broth and that just doesn’t fly in this kitchen. I deglazed the onions with beer (Kona Brewing Co’s Longboard Lager) because who doesn’t love boozy onions, but you could use vegetable broth or even water and get similar results. Joy struck gold with this recipe, turning this wintery comfort soup into a sandwich that can be enjoyed in the middle of June with some salt & vinegar chips and rootbeer over crushed ice. P.S. — Molly also stuffed her sandwich with something green AND served it with chips! We’re totally destined to do this together. Heat medium, heavy-bottom saucepan over medium heat. Add butter and oil and stir until butter is completely melted, then add all of the onions. Toss onions in butter and oil mixture until completely coated, then allow onions to cook undisturbed for four minutes. After four minutes, stir in salt, pepper, and thyme. Place lid on the pan and allow onions to cook four minutes at a time, stirring occasionally. If onions begin to brown too quickly, lower the heat. Once onions are totally browned and soft, deglaze the pan by adding the your liquid of choice (beer, wine, beef broth, chicken broth, veggie broth, water). With a wooden spoon, scrape the sticky onion bits from the bottom of the pan — there’s a lot of flavor there! When the liquid evaporates (about 30 seconds), remove pan from heat and set onions aside. Butter one side of each slice of bread. Place bread butter side down in in a medium saute pan, and top with gruyere, onions, arugula, and more gruyere. Place other slice of bread on top of sandwich (butter side up), and cook over medium heat until bottom is golden. Flip the sandwich and cook until insides are melty. Serve at once!